In what was supposed to be their toughest test of the season, ended up being business as usual for the Green Bay Packers as the defeated the Detroit Lions 27-15. The victory keeps Green Bay’s perfect record in tact at 11-0. 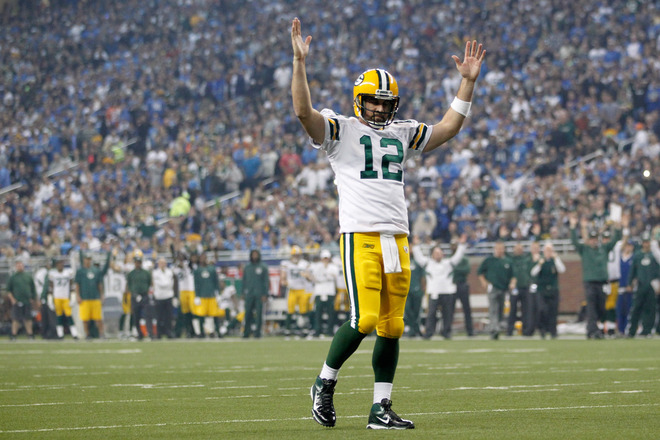 Up only 7-0 at the half, Green Bay put the foot on the gas in the second half, led once again by Aaron Rodgers. Rodgers who 22 of 33 passes for 307 yards a 2 touchdowns. Packers receiver James Jones caught 3 balls for 94 yards and a touchdown while Greg Jennings also caught a touchdown pass, finishing with 5 catches for 74 yards. Lions quarterback Matthew Stafford struggled throwing 3 interceptions. He did connect on a touchdown pass to Calvin Johnson late in the game. Lions defensive tackle Ndamukong Suh was ejected in the third quarter for stomping on a Green Bay offensive lineman after a play. Down 19-17 late on the fourth, Dallas Cowboys quarterback Tony Romo engineered a late drive that resulted in a Dan Bailey 28-yard game winning field goal as time expired. Tony Romo finished with 226 yards, 2 touchdowns, and 2 interceptions. Both of Romo’s touchdown passes were caught be Laurent Robinson, who now has 5 straight games with a touchdown reception. Along with the two touchdowns, Robinson had 7 catches for 79 yards. Miami Dolphins quarterback Matt Moore passed for 288 yards and a touchdown, but had 3 fumbles including one lost. Receiver Brandon Marshall caught 5 passes for 103 yards and a touchdown. In the highly publicized match up of the Harbaugh brothers, it was John Harbaugh who got the best of his brother Jim Harbaugh as the Baltimore Ravens dominated the San Francisco 49ers 16-6. In a dominating defensive effort the Ravens defense sacked Niners quarterback Alex Smith 9 times, including 3 by Terrell Suggs. Ravens quarterback Joe Flacco passed for 161 yards and a touchdown.